Filmed in Scotland, OUTLAW KING reunites director David Mackenzie (Hell or High Water) with star Chris Pine alongside Aaron Taylor-Johnson, Florence Pugh and Billy Howle. Mackenzie’s other credits include the excellent 2011 end of the world drama Perfect Sense as well as Young Adam, Hallam Foe, Spread, Tonight You’re Mine, Starred Up, and more. He also co-wrote the screenplay for Outlaw King along with Mark Bomback, Bathsheba Doran, David Harrower, and James MacInnes. We’ve seen a version of this story told before in Mel Gibson’s Braveheart, with Robert the Bruce played by Angus Macfadyen. Braveheart however is not considered to be historically accurate, and in fact, Bruce himself is considered to be the real “braveheart.” Macfadyen is actually playing Bruce once again in another upcoming movie about the historical figure, which is titled Robert the Bruce and is planned for a release sometime in 2019. 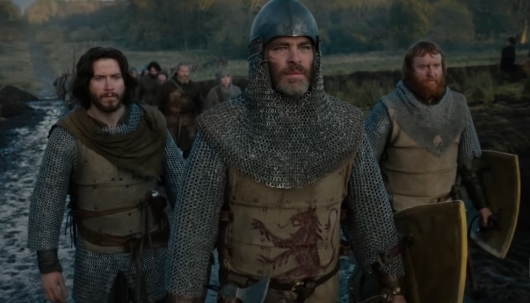 Outlaw King is set to be released in select theaters on November 9th, and will also be released on Netflix.